As detailed in the introduction video, when using Mention, we recommend you to look at your earned conversation (generated organically) and your owned conversation (generated by mainly your social media content). How to evaluate your brand? To evaluate your earned conversations, you’ll need to have an alert of your company created. Once you have your first results, you can create a listening report about this alert (in the reports tab). In this report, you’ll see the volume over time, the sentiment of your mentions and the main influencers who talked about your brand. If you want to have a more detailed list about the influencers talking about your brand, visit the influencer tab. How to benchmark your brand against competitors? To better understand your market position, you'll need to benchmark those numbers against those of your competitors. For that, you can create an alert for each of the competitors you want to track and then, create a competitive report to compare them. You might want to compare the overall volume of mention, the volume on each source and the overall sentiment to identify what your strengths and weaknesses are. To evaluate the conversations that happen on your own channels, you can create a social performance report for your twitter profile, your Facebook page and your Instagram profile. 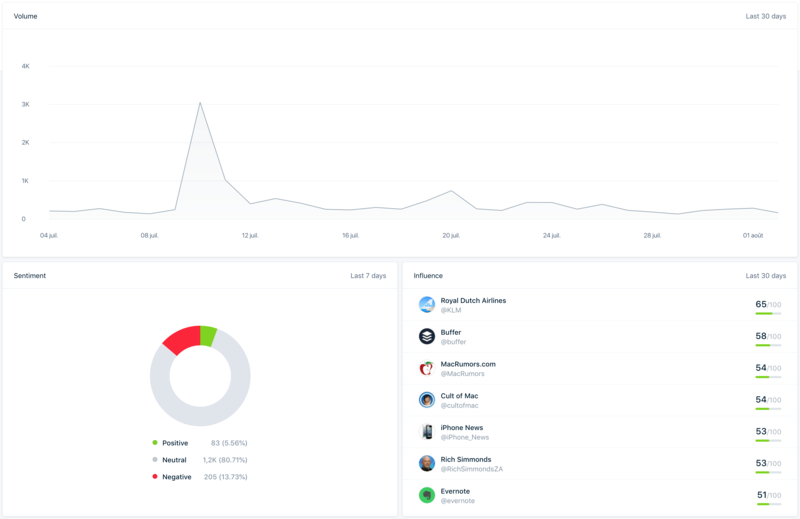 In those reports, you'll see the total number of reactions your posts have generated, and the ones that worked the best. Again, it’s easier to compare those numbers against those of your competitors to know how well you are performing. To do so, you can create a competitive social report on the same platform as the social performance one. In those reports, you'll be able to compare your audience size, the frequency of the posts and the posts that worked the best across the competitors.